Upendra Kushwaha is known to have ruffled feathers in the NDA camp recently for meeting Loktantrik Janata Dal founder Sharad Yadav. 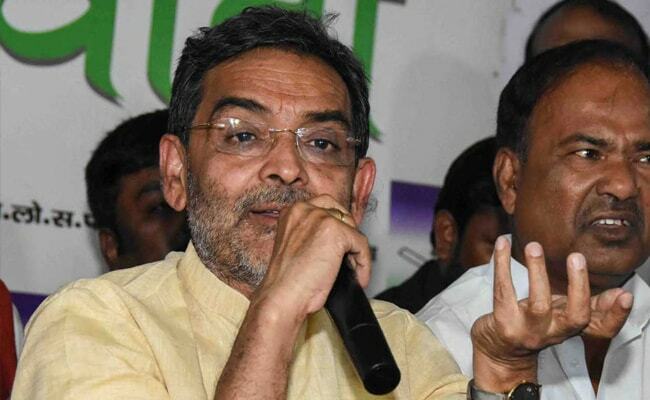 Union minister and Rashtriya Lok Samata Party (RLSP) president Upendra Kushwaha said on Monday that attempts by the ruling JD(U) to poach his MLAs could "harm the NDA" in Bihar and sought intervention of the BJP in the matter. Mr Kushwaha, who is known to have ruffled feathers in the NDA camp recently for meeting Loktantrik Janata Dal founder Sharad Yadav in New Delhi, also took a dig at Chief Minister Nitish Kumar, saying his clout wasn't dependent on just one or two MLAs. "I will not suffer any political damage if Nitish Kumar's JD(U) succeeds in its plans. I am not one whose political clout depends on the support of one or two MLAs," Kushwaha said in reply to queries about reports that two legislators of his party - Lalan Paswan and Sudhanshu Shekhar - might switch over to the ruling party. The speculations were triggered following Mr Shekhar's meeting with JD-U vice president Prashant Kishor on Sunday. Mr Kushwaha came out with a couple of angry tweets soon after, calling Mr Kumar "adept" in poaching leaders belonging to other parties. "Such a development - which involves two constituents of the same coalition - may not augur well for the NDA. It may lead to confusion and even anger. I think the BJP should intervene in the matter," he told reporters upon his arrival from New Delhi. The RLSP chief left for the national capital on Sunday morning saying he would draw the attention of BJP national president Amit Shah towards the "humiliation" he was facing at the hands of Mr Kumar. Maintaining that his party had an alliance with the BJP, not the JD(U), Mr Kushwaha also sought to discuss with Mr Shah the issue of seat-sharing among NDA constituents in Bihar. He, however, failed to get an appointment with the saffron party chief. The RLSP president has been miffed over reports that the BJP and the JD(U) might together fight 34 out of the 40 Lok Sabha seats in Bihar and RLSP- which had contested and won three in 2014 - may be asked to make a "sacrifice" and settle for a lesser number. The Union minister has been expressing his disapproval over such a formula, pointing out that his party was not considered for a ministerial berth in Bihar when the NDA assumed power here last year following Mr Kumar's return to the coalition. Meanwhile, the LJP headed by Union minister Ram Vilas Paswan - whom Mr Kushwaha had met here on Sunday to share his concerns over seat-sharing among NDA partners - appeared t have thrown its weight behind the JD(U). LJP parliamentary board chairman Chirag Paswan met JD(U) chief Mr Kumar and Prashant Kishor and disapproved of the RLSP chief's hobnobbing with those opposed to the NDA. Upon emerging from the 7, Circular Road bungalow, adjacent to the chief minister's official residence, from where Kishor has been running his affairs, Mr Paswan said: "It was a courtesy call on the occasion of Chhath festival though we did have some cursory talks on political matters." Mr Kushwaha's outbursts seem to be like one-way traffic. He has been attacking the JD(U) though there has been no provocation or even retaliation from the latter." Mr Paswan's sentiments were echoed by JD(U) national general secretary K C Tyagi who also said that it was "inappropriate and harmful" for a union minister to have met an opposition leader who is strongly against the NDA and its government. Mr Kushwaha, in his defence, said, "I have enough sense to decide whom I should meet and when and where". Significantly, Mr Paswan's meeting with Kumar and Kishor took place in the presence of Sumit Singh - son of former Bihar minister Narendra Singh, who hails from Jamui district, which is the LJP leader's parliamentary constituency. Mr Paswan and Mr Singh have been at loggerheads for quite some time and it is believed that Mr Kishor brokered peace between the squabbling two.